Christopher Radko 2016 Balancing the Date Santa Glass Christmas Ornament - 7.25''h. View More In Figurine Ornaments. Christopher Radko Ornaments Are Mouth Blown and Hand Painted In Poland. This Santa Is Holding A Stack Of Presents. The Front Of The Packages Is Decorated With "2016" In White Glitter That Is Outlined In Gold Glitter. This Santa Ornament Will Come Packaged In A Christopher Radko Presentation Box. 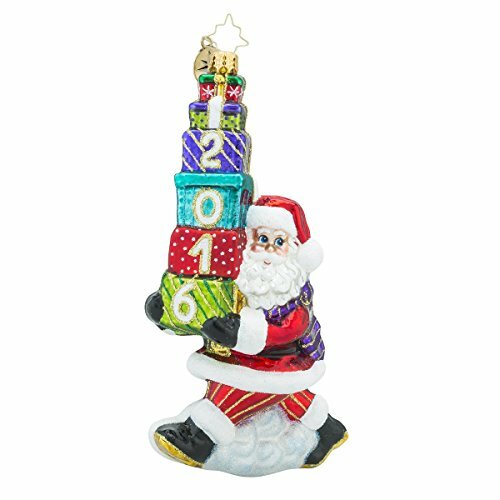 The 2016 Balancing The Date Santa Ornament Measures 7.25"H.
This Santa Is Holding A Stack Of Presents. The Front Of The Packages Is Decorated With "2016" In White Glitter That Is Outlined In Gold Glitter. The Ornament Comes in Its Own Christopher Radko Presentation Box. If you have any questions about this product by Christopher Radko, contact us by completing and submitting the form below. If you are looking for a specif part number, please include it with your message. Bronze Swan Statue Or Hong In Thai Handcrafted From Northern Thailand, Chiangmai.